When the American Psychiatric Association released the 5th edition of the Diagnostic and Statistical Manual of Mental Disorders (DSM-5) in 2013, it included several changes that affect SLPs working with children with language and communication disorders; namely, it added the diagnostic category of Social (Pragmatic) Communication Disorder (SCD) and changed the way it describes Autism Spectrum Disorder (ASD). 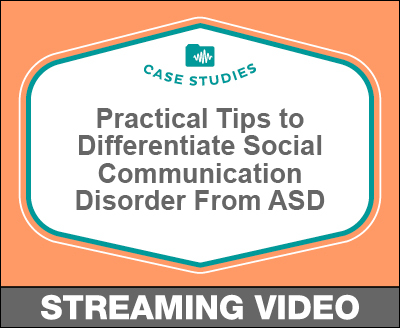 The new SCD category includes difficulties with social uses of both verbal and nonverbal communication, which overlaps with the social communication impairments that now define ASD. As a result, many professionals are understandably confused about how to distinguish between SCD and ASD and which diagnosis best suits their children in terms of the services they will qualify for. This course will offer tips, tools, and checklists with which to differentially diagnose based on observed symptoms in order to provide appropriate and effective treatments for children with these disorders.